On 17th December 2018 we held a whole school celebration for Qatar National Day which also marked the end of a successful first term at the RGS. Pupils, staff and parents arrived at school in a range of wonderful clothing representing the country we live in. There was traditional Qatari dress, colourful clothing linked to the Qatari flag, and even military and police uniforms. Thank you so much to everyone for putting in such an effort. The morning started with a whole school assembly, expertly presented by Suereya and Kenda. Pupils from Reception to Year 6 joined together to lead the School in a stirring rendition of the Qatar National Anthem before we enjoyed musical performances from pupils in Year 5, Key Stage 3 and those who participate in ukulele and guitar ECA. 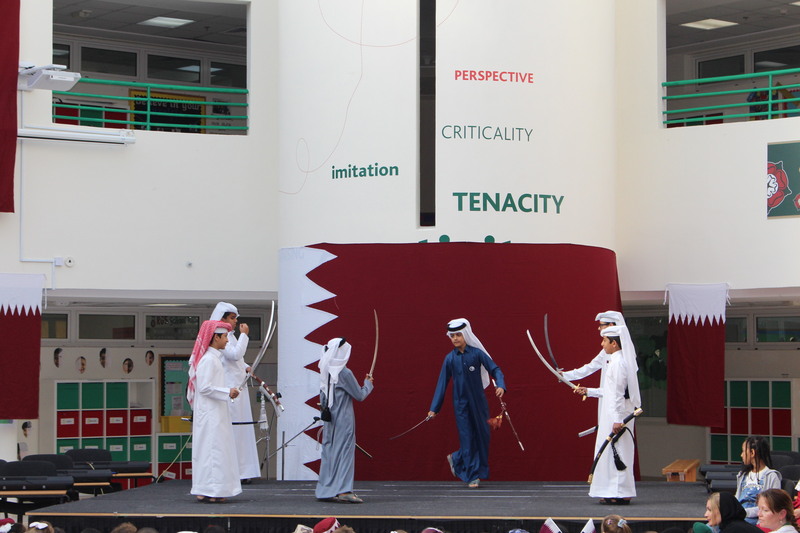 Boys in Year 6 and 7 took to the stage to perform a traditional Qatari Sword Dance and we heard poems from pupils in Early Years and Key Stage 3. Pupils across the School also spoke about what they love about Qatar. Whole School events provide pupils with the opportunity to perform to an audience and it was wonderful to see so many pupils having the confidence to do so. Qatar National Day is celebrated annually on December 18th, commemorating the inception of the modern state of Qatar in 1878. It is a day to celebrate the unique history and heritage of the Qatari people and to keep past traditions alive. Therefore, throughout the morning, pupils took part in a series of activities to support their learning about Qatar, past and present. These included Arabic bread making, Henna and Tattoo painting, storytelling in the Majlis, Arabic calligraphy, handball and even ‘camel racing.’ Pupils also had the opportunity to complete drawings of a camel who visited our school for the day and hold a falcon! The final activity of the morning was our family picnic which took place outside. This was an opportunity for our whole community to come together and celebrate not only Qatar National Day, but also the end of Term 1. It was lovely to see so many parents in school socialising with each other and I would like to take this opportunity to thank parents for supporting this event and the School throughout term 1.